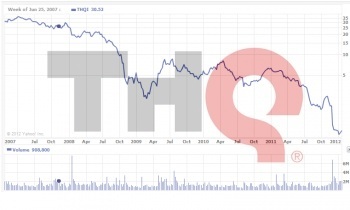 The latest news to come out of THQ is a little bit good, and a little bit bad. THQ announced today that it has entered into a "forbearance agreement" with Wells Fargo Capital Finance, under which Wells Fargo has agreed to put off "exercising its rights and remedies against THQ and its subsidiaries with respect to previous events of default under its credit facility." That mouthful of fun relates to an SEC filing earlier this month in which THQ revealed that it had defaulted on its credit facility, leading to negotiations between the two companies which ultimately culminated in a decision by Wells Fargo to not drop the hammer. The deal extends to January 15, 2013, during which time Wells Fargo will make further loans, "subject to the terms and conditions of the forbearance agreement," to help keep the lights on at THQ. "We are pleased to have reached an agreement with Wells Fargo. This agreement enables us to continue focusing on bringing our games in development to market," THQ Chair and CEO Brian Farrell said in a statement. "Meanwhile, we are evaluating financial alternatives that will transition the company into its next phase." That's the good news. The bad news is that Executive Vice President and Chief Financial Officer Paul Pucino has left the building, which I don't think is ever a good sign for companies struggling to avoid financial collapse. "We would like to thank Paul for his significant contributions over the past four years and wish him well in his future endeavors," Farrell said. THQ is now considering replacements, and in the meantime has hired a consulting firm to step into the breach.